To book a course or workshop, or just make a general enquiry, you can email us at or contact us by phone on 07914601458. We don't always get to answer the phone so please leave a message and we'll reply as soon as we can. You can order from our fabric range in our online shop. Teignmouth is easy to get to from anywhere, and is an ideal place for a weekend away with some sewing as well! By road - A380 and M5 just 7 miles. For parking see below. By rail - main line station. Great Western Paddington line trains run to Teignmouth as do Cross Country for the Midlands and North. By air - Exeter International Airport is only 18 miles away with bus and train connections to Teignmouth. By bus - a number of bus operators serve the town. Please use this area to tell us what your sewing interests are, and if you would like us to phone you, please leave your number here too. 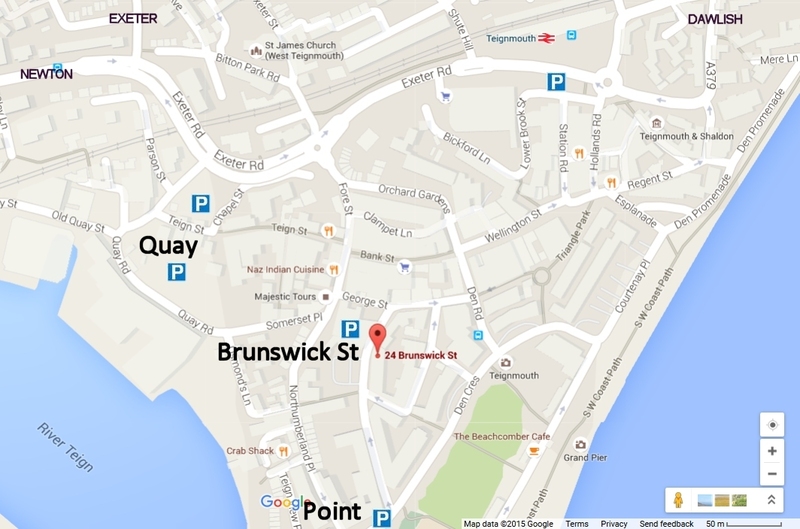 Parking is available at Brunswick Street car park, opposite the shop. Maximum stay is 4 hours and the traffic wardens are vigilant! If you wish to stay longer, we suggest either the Quay or Point car parks, a short walk away. Open the thumbnail for a bigger map with the car parks marked. If you sign up for our newsletter we will send you occasional updates about our shop, courses and workshops but we guarantee that we will never sell, or even give, your information to anyone else. Your name and email address are the only pieces of information we ask for so we can send the newsletter to you. Optionally, you can choose to tell us about your sewing interests but you don't have to.